The Russian military marvel of ingenuity, the T–14 tank based on an Armata armored platform, was from the outset designed to become a remote-controlled land-drone capable of confronting any challenges posed by the 21st century, manufacturers say. “Quite possibly, future wars will be waged without human involvement, that is why we have made provisions for possible robotization of Armata,” deputy director general of UralVagonZavod manufacturer, Vyacheslav Khalitov, told Technowars. While the remote control is a relatively easy task, implementing the idea of full robotization will require the creation of such an AI, that could “calculate the situation on the battlefield and, on this basis, to take the right decision,” Khalitov added. The tank will serve the Russian armed forces throughout the 21st century, ready to face any challenges, Khalitov added, according to Kommersant. Armata platform allows automatization of many of the processes that could previously be done only manually by crew, including controls of the machine movement. Deputy Prime Minister Dmitry Rogozin, specified that eventual remote control of the tank was envisioned from the very first stages of the projects. The changes in the internal layout of the vehicle due to removal of the crew will increase the space for extra ammunition and fuel by some 50 percent, according to the latest edition of the Uralvagonzavod magazine. In some cases this could allow to double maximum distance or payload for specific mission. 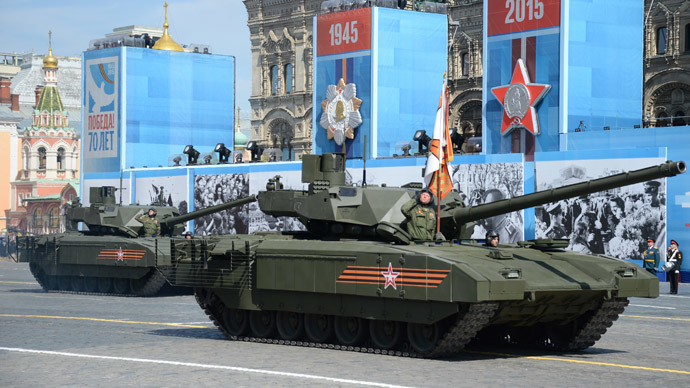 The next generation T-14 tank, based on the Armata platform, was presented to the general public by the Defense ministry at the Victory Day military parade in Moscow on May 9. Only twenty T-14s have been produced in Russia so far, with Defense Ministry planning to conclude final military tests in 2015. Preliminary estimates say 2,300 T-14 Armata units are required for the Russian Army to be fully re-stocked and combat efficient. The tank’s main design feature is the armored capsule for the three-man crew, placed in the front of the vehicle and isolated from the rounds rack for extra safety. The Armata T-14 features an unmanned turret, so its main armament – the 125mm smoothbore cannon and 7.62mm machine gun – are therefore already fully remotely controlled. It is presumed that full authorization and remote piloting will be available across an entire Armata armored platform. Besides the T-14 battle tank, the platform can be used for over a dozen military vehicles including a personnel carrier, self-propelled artillery and an air defense system.